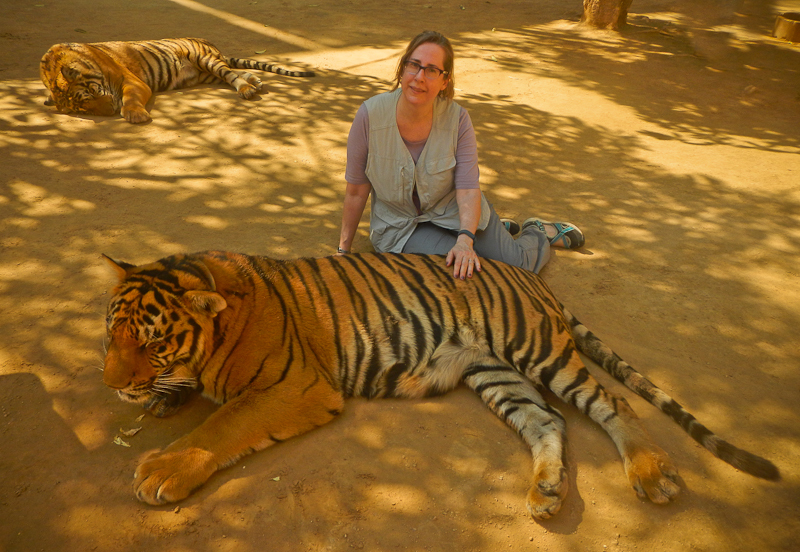 I sat down next to a fully grown Southeast Asian Tiger and petted it. Actually, I did that with four different tigers. Don’t get me wrong, it isn’t something anyone would do casually. That said, if I had thought about it for much longer, I probably wouldn’t have done it. You can’t see very well from the photo, but each tiger has a sturdy steel collar around its neck that is chained to post driven into the rock. But is the tiger strong enough to pull it out and maul someone? Who knows. If the tiger attacked me, would I be fast enough in leaping away? I can’t count on it. I was assured that the Buddhist monks, who’ve raised these tigers since they were cubs, have fed them well and gotten them accustomed to these sorts of interactions with people. All the tigers certainly look well cared for. The fur feels just like healthy short-haired cat fur. But what if one of the tigers just wanted to “play”? Cats can certainly shred their toys when the mood takes them. Oh, and there have been “incidents” at the Tiger Temple in Kanchanaburi, Thailand. They do make sure that visitors don’t do things to set off the tigers – so you can’t wear sunglasses, or hats, or red clothing. The guides take you by the hand and lead you slowly to the tiger, showing you where to sit. They encourage you to pet the tiger. My pulse was pounding so much at first that I couldn’t quite manage to touch the tiger or to smile. All I could think about was that even though the tiger was napping in the hot afternoon sun, it could smell fear. Probably the scariest moment was with a tiger sleeping on a ledge. I had to climb up a few steps to where I sat, and there was a rock wall right at my back. When I sat down, the tiger was asleep with its head under its paw. The next thing I knew, it woke up and stretched. So now I’m back in the United States, where the entire experience is utterly impossible for many reasons, and I’m pondering whether it’s a good thing to be able to do this. To be sure, there have been criticisms of Tiger Temple for not working with conservation groups and for promoting the idea that these tigers can eventually be released into the wild, when that can’t happen. I have a hard time being critical of what the Buddhist monks are doing, even if they could be contributing more to tiger conservation and spending less of the proceeds they get from tourists on building a fine new temple. They do raise awareness as to the rapidly diminishing numbers of tigers in SE Asia. 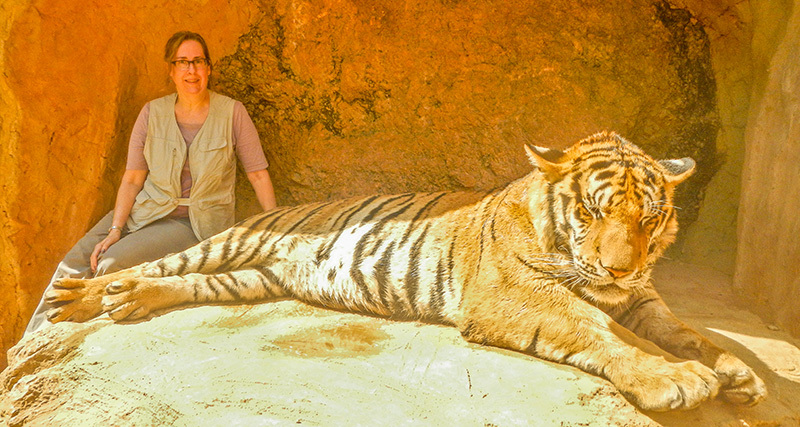 Plus, nobody with a heart can walk among these magnificent beasts without wanting to help preserve wild tigers. And if, one day, there is not enough wilderness for a viable tiger population, isn’t it a good thing that the monks can contribute what they’ve learned about raising Southeast Asian tigers in captivity?